One thumb is, but the other still need a few rows of ribbing to be complete. 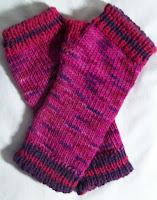 All the ends have been woven in, on both gloves--so once the thumb ribbing is knit, and those two ends worked in--a FO! I got the first thumb done on subway—and managed to lose the small (size 2) circ I was using to pick up the stitches—I find it is easier to pick (with a needle, not with yarn) and then knit –and as the same time divide the stitches evenly for working in the round. And I do the pick up with a smaller needle (so much easier to get the stitches on the small needle!) The circ I lost was a ‘reject one’ (too short for my comfort for general knitting) but it was still useful for project like this—And losing it messed up my finishing! So I went to work on the matching hat. Hat? Did I say hat? 20 inches –or so would be a good size for the hat band (for my huge head) Based on my gauge for the fingerless gloves, that would be 40 stitches + 40 stitches (15 inches) +20 (another 3.5 inches) +the extra from rounding up (another inch)—or almost 20 inches.. a good number. Too bad I cast on 120! (3 times 40(and 38 stitches =7.5 inches)—or over 22.5 inches! )—0% negative ease. And with that many cast on, I didn’t have much of ribbed band –counting the tubular cast on, 4 rounds of 1 X 1 ribbing. Certainly not enough to support a hat. Well I could have frogged—but instead made a snap decision—this is not going to be a hat—it’s going to be a neck ring! It’s a nice size to easily pull over my head—and the narrow edging of ribbing is fine for a neck ring. I am knitting it in spiral stripe. This is fun method of striping. You use X (3, 4, 5 what ever number) balls of yarn. The yarn can be all different colors, or not. For this project, X=4, 2 balls of raspberry, 2 balls of grape. The only yarn you have available to knit with is B4—so knit G1 with B4. At the end of the round, you’ll only have 1 ball of yarn avail able (B3—use it to knit G1)—and for R2 basic repeat the process—knit a group, change yarns (to one from previous R, and repeat. The result is spiral stripe—a jogless stripe, too. If I had 4 different colors I would end up with 1 row of each color and a repeat of the stripe pattern (A, B, C, D) every 4 R’s. It's one of those things that are easier done than explained! The stripes of the neck ring will echo the stripes on the ribbing of the fingerless glove—and it makes the knitting a bit more interesting. Labels: Fruity fingerless gloves., Fruity neck ring, spiral knitting. I love the spiral stripe--it truly is jogless and really fun to do. Can't wait to see your finished neck ring.